A takin from Bhutan could become a permanent exhibit at the Smithsonian Institution’s national zoo in Washington DC if the Bhutanese government agrees to a proposal by the Bhutan Foundation. Officials of the Bhutan’s permanent mission in New York, the Bhutan Foundation (BF) and the Smithsonian Institution’s national zoo in Washington DC are waiting to hear from the Bhutanese government on the proposal in housing a Bhutan takin at the zoo. The takin (budorcas taxicolor white) is the national animal of Bhutan. The Drukpa Kuenley connection The takin is the national animal of Bhutan. According to legend, when Lam Drukpa Kuenley visited Bhutan in the 15th century, the people urged him to perform a miracle. But he demanded that he first be served a whole cow and a goat for lunch. He devoured these and left only bones. He then took the goat’s head and stuck it onto the bones of the cow. And then with a snap of his fingers, he commanded the strange beast to rise up and graze on the mountainside. The animal arose and ran up to the meadows to graze. It came to be known as the drong gyem tsey (takin) .These animals can be seen grazing in alpine meadows of the high eastern Himalayas. Bhutan’s ambassador at the permanent mission, Lhatu Wangchuk, said he strongly recommended for consideration BF’s proposal. “The exhibit will not only promote Bhutan it could also serve as a gift from the people of Bhutan to the people of the United States,” he said. The proposal was submitted after officials of the national zoo expressed a strong interest in housing a takin in a very prominent place, right next to the giant pandas, as part of its ‘Asia Trails’ exhibit. More than three million visitors pass through the zoo every year, and most people come to view the giant pandas. As the takin exhibit will be right next to the pandas, it will also get significant traffic and exposure, according to Bhutan Foundation officials. “If the exhibit can be set up to demonstrate some cultural and ecological landscapes related to Bhutan, this would be a good marketing tool and exposure for Bhutan, and a good presence of neutral Bhutanese representation in the US capital city,” a BF official said. Dennies Kelly also said the animal can be sourced from other zoos in the US and Europe that already has the Bhutan takin. If Bhutan is not interested, the exhibit could also be on Chinese takins, which are readily available. According to Tshewang R Wangchuk, conservation adviser with the Bhutan Foundation in Washington DC, the Bhutan takin is one of four sub-species of takins (goat-antelope) that exists in Asia. They are geographically isolated from the other takins. 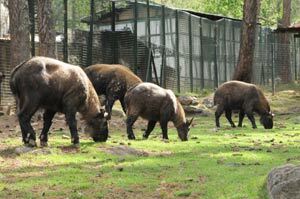 The Mishmi, Sichuan, and Golden takins are the other sub-species, and are found in northeast India, Myanmar and China. In preparing for the exhibit, the Smithsonian Institution (SI) showed interest to put together a larger program that supports in-situ conservation of the Bhutan takin, and trains Bhutanese wildlife biologists in the process. In January this year, the Bhutan Foundation and Smithsonian Institution officials met and identified four areas of mutually beneficial collaboration: establishing a natural history unit at UWICE in Bumthang, building the capacity of the institute’s conservation genetics laboratory, training in wildlife monitoring, and collaboration in setting up long-term research and monitoring forests based on Bhutan’s needs and the vast extent of experience at the Smithsonian.